Cartilage and bone are specialized skeletal tissues composed of unique extracellular matrices. Bone, in particular, has a highly calcified or mineralized matrix that makes microtomy and standard histological studies very challenging. Therefore, methods to appropriately fix and decalcify mineralized skeletal tissues have been developed to allow for paraffin processing and standard microtomy. In this chapter, we illustrate methods for tissue grossing, fixation, decalcification, paraffin processing, embedding, sectioning, and routine histological staining of demineralized murine skeletal tissues. 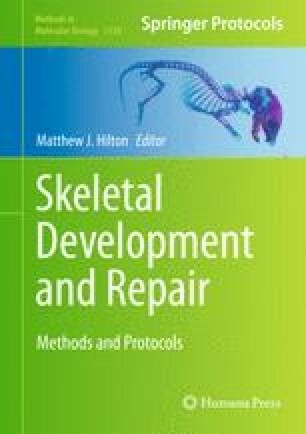 We also discuss methods for decalcified frozen sectioning of skeletal tissues with and without the use of a tape-transfer system. We would like to thank Ryan Tierney for the initial development of some of these protocols. This work was supported in part by an NIH P30 Core Centers Grant (AR061307) and R01 grants (AR057022 and AR063071) to MJH.